This week we are cooking up some great take-to-work lunch ideas! Check back daily this week for lunchtime inspiration. If you’re like us and sometimes don’t have a particularly productive Sunday, and don’t end up cooking anything at all that you could take to lunch on Monday, we’ve got you covered with a super simple almost no-cook meal! Here we have a ploughman’s lunch — a traditional UK meal of meat, cheese, and typically a beer (but we wouldn’t want our workday productivity to drop, would we?). 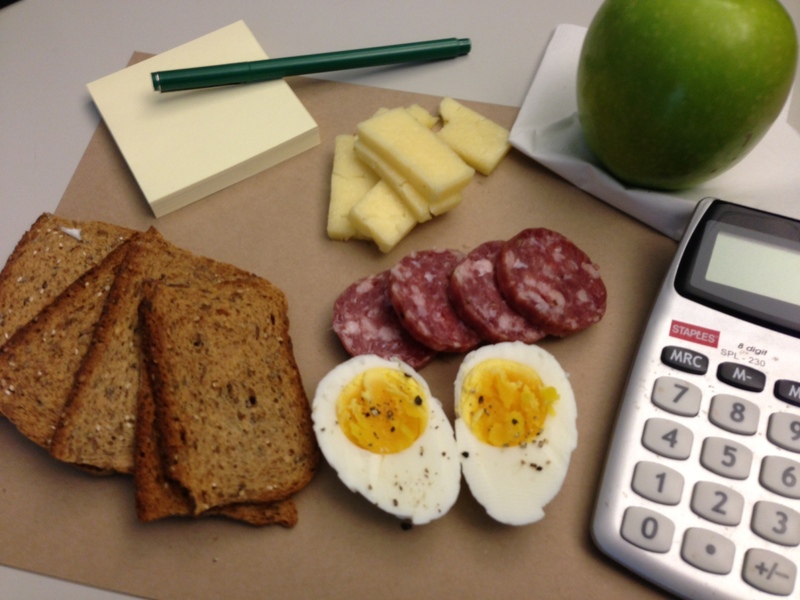 So grab a piece of fruit, some cheese, cured meat, bread or crackers, and a not quite hard boiled egg (bring water/egg to a boil, turn off heat and cook 4-5 minutes) and get down to lunchtime business! This entry was posted in Work Week Lunches and tagged bread, cheese, fruit, hardboiled egg, meat, ploughman's lunch, work week lunch. Bookmark the permalink.